The narrator of this extraordinary tale is a man in search for truth. He answers an ad in a local newspaper from a teacher looking for serious pupils, only to find himself alone in an abandoned office with a full-grown gorilla who is nibbling delicately on a slender branch. "You are the teacher?" he asks incredulously. 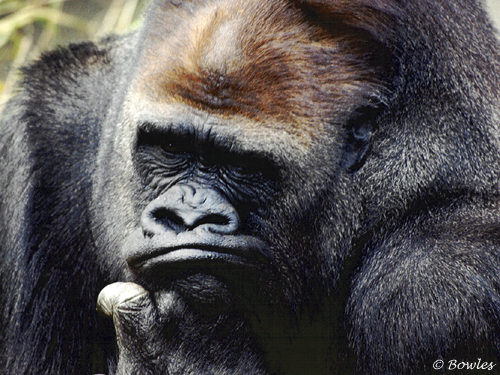 "I am the teacher," the gorilla replies. Ishmael is a creature of immense wisdom and he has a story to tell, one that no other human being has ever heard. It is a story that extends backward and forward over the lifespan of the earth from the birth of time to a future there is still time save. Like all great teachers, Ishmael refuses to make the lesson easy; he demands the final illumination to come from within ourselves. Is it man's destiny to rule the world? Or is it a higher destiny possible for him-- one more wonderful than he has ever imagined? Will be sent to Rubyblue in the Netherlands. Enjoy! I received this book today in the mail from MrBones. Strangely enough, the postwoman delivering the book knocked at the very moment I was reading a forum message posted by MrBones about trading books by mail with other BookCrossers. What are the chances? On the back cover: "Teacher seeks pupil. Must have an earnest desire to save the world. Apply in person." I think I'm going to like this book. Just received an email from LarkonaPost, a BookCrosser in the States, who apparently saw my forum message about the eerie arrival of "Ishmael," asking if I'd like to read it "together" with her. She plans to start reading the book soon, and proposed that after the first 60 pages or so, we "discuss" it. I hesitantly agreed, fearing lack of time and lack of insight might be problems. Now, however, after reading the remarks on the back cover, I think it will be fun to see how this goes. Thanks MrBones, and thanks for the postcard. Regensburg looks beautiful. I've never been interested in visiting Germany before, but this card makes it look very tempting. 12 February 2004: This book for some reason doesn't want to leave my house. I intended to release it at the meeting in Utrecht, but when I arrived home, I found it still here. So, now I plan to release it at the next meeting 10 April, in Amsterdam. I will make a point of seeing that it is in my backpack or whatever. Rubyblue, I could have known this came from you. You always seem to have a gem for me stored somewhere about your person. The aim of this book seems to be quite along my line of work, being with the Jane Goodall Institute. No, that's not the gorilla lady, that would be Dain Fossey. But chimpansees are primates alright and Jane's mission is to get across that we are part of the natural world. I am very curious about this book. Perhaps, if it is interesting, I will cross it to Jane, see if she knows it. Now, what are the odds of someone putting this in my hands? What is it with this book? I have started reading it and already I am fascinated. Ishmael does take his time to get his message across, which can be tedious sometimes. This concept though, about the myth of our culture, which we cannot perceive as such, is enriching for me: that evolution eventually reached its destination when human beings arrived at the stage. It is a myth indeed. I see I intended to pass this book to Jane Goodall, but obviously I started reading too late, she just left last Friday. I have another chance, next month. I will have finished by then, for sure. I finished it today, I could not leave it alone. When I was driving and got stuck in a traffic jam, I even continued. It moved me, for there were so many pieces of the puzzle I have been wondering about for years, that suddenly came together. This is the first book I have encountered which actually steps away from our culture and looks at it from a distance, to analyse it to the bone. How did things come to be? This book gives the answer. What are we to do? Understand this, see the wrongness of things, try to behave differently, make different choices, every day, in our everyday world, and speak up. Let our voice be heard. We are not alone, there are more people wanting to change things. All it takes is a critical mass. I am back on the track I chose for myself this life. I needed this inspiration badly. Rubyblue, I cannot thank you enough. This book will go to Jane Goodall, June 25, when she is in the Netherlands again. Jane Goodall says she has at least three copies of this book somewhere in her house, she just hadn't gotten round to reading it. I urged her to do so. Also I contacted my colleagues from the Jane Goodall Institute abroad and advised them to read this book, I asked for another of Quinn's books - beyond civilisation, received and read it in one day, I contacted the www.Ishmael.org website, became a member of that community, read all his articles and printed them out for numerous people, I contacted Daniel Quinn, informed him about our organisation, inquired about ways we could join forces, I made an order for all his other books, both in Dutch and in English and now I only have to find someone else for this copy of Ishmael. There's too many people to choose from, who should all read this book. I think I will buy copies by the dozen. Quite an impact, this made on me. Released on Thursday, August 26, 2004 at Controlled Release in Controlled Release, Controlled Release Controlled Releases. Ishmael goes to Plinius first. opened this packet while in the beautician's waitingroom and was lost in the story immediately. Half an hour later the beautician started to apologize for being late but I hadn't noticed the time and only smiled absentmindedly. Thank you, Biba! This must be the best novel I've read in years! In 'Ishmael' Daniel Quinn takes anthropology, sociology, history, mythology and philosophy and uses them to answer the question 'What's wrong with modern man?' You won't forget these lessons. The form of the novel is a discussion between the narrator and Ishmael. Unputdownable. I just finished the book and my head is still buzzing with questions all concerning one subject: how can we change the way we are living, is it possible to change the law that says man will rule the world till the end (and that's coming!). Lots of thinking!!! after a long walk in the sun and the wind, i found this book when i came home. reading the message from biba and all your commentaries makes me curious, so i'll start reading today. thanks biba for ringing and janna for sending it. I finished the book yesterday. The theme of the book is important and told in an interesting way. You have to look different at things you are used to. Also the story how and why Ishmael disappeared from the office building was not to good, to my opinion. But on the whole, I'm glad to have read the book. for me this was a symbolic experience. I'm not too optimistic about the future and about survival of mankind. but nature will survive somehow, even on top of great disasters. Released on Monday, November 01, 2004 at about 8:00:00 AM BX time (GMT-06:00) Central Time (US & Canada) at BookRing in Book Ring, A Bookring Controlled Releases. This book arrived safely in my mailbox. Later I will write more. I have decided to send this book on his travels again. I did not finish it. I'm 60 pages from the end, but it has been a struggle and the book will not win this time, I'm afraid. Why? Well, there is one important reason. While reading this book I read another book for my philosopphy study: 'Wij zijn nooit modern geweest' (We have never been modern) by the french philosopher Bruno Latour. He points out the same problems as Ishmael does and there are more parallels for example the way they see humans and how humanity "works" nowadays. Both books are a cry for a new frame of mind, the only solution to the problems that are starting to overwhelm us. Latour appeals more to my rational mind. This would not be a problem if Ishmael would appeal to my feelings, but it seems to me that the book doesn't want to do that. It wants to make an impression on my rational thinking. I have to follow the reasoning. And I have a problem with the reasoning, not because it is done by a gorilla, not because it tells me we live in a myth (I think we do indeed), but because I have questions where the pupil says 'of course'. I have trouble believing in the purposefulness (is this an English word) of the humanity/takers. I have also trouble believing the historical foundation of the taker-theory and the definition of a lot of concepts and notions, for example the placing and definition of morality around the Tree of Good and Evil. For me, Latour has a more convincing (historical) explanation for the same problems . This may also have to do with me being thouroughly atheist, even by upbringing. I cannot relate to the biblical aspects of and references in the book. Furthermore am I very postmodern in scientifical upbringing and conviction and Latour takes postmodernism into account (though he is very critical towards it), whereas Ishmael doesn't. 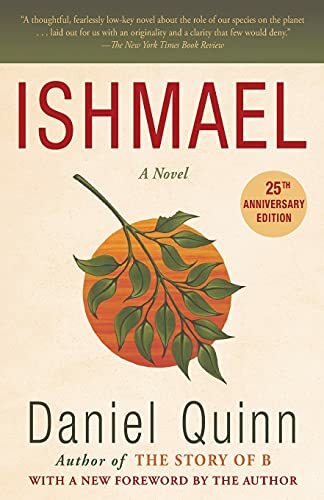 I just think this is not the book for me, because it doesn't press the right buttons in me, however much I think Ishmael pushes very important issues to the front. I received this book in the mail yesterday - together with a most appropriate postcard, thank you Lot :-) - and from what I read on the first pages, it looks promising. 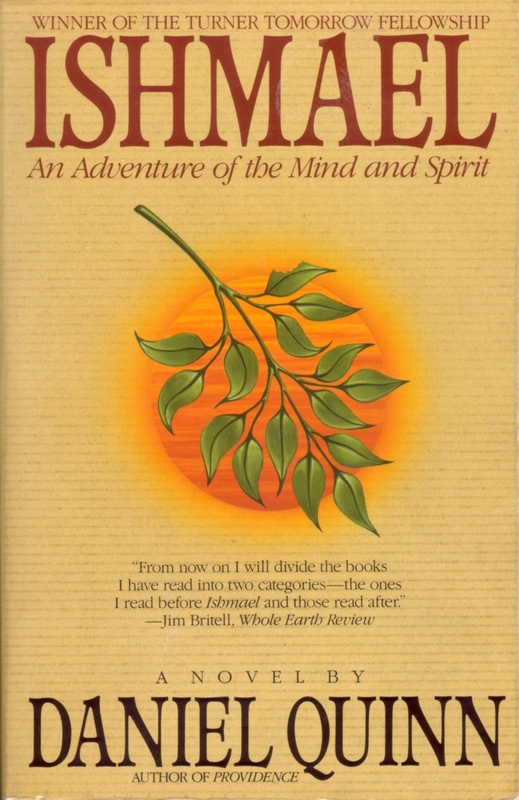 Interesting book, although great part of Ishmael's philosophy is not entirely new for me. In fact, I've been thinking about the ethical question of human concern for human kind since years... the world food programme, helping young babies born with congenital defects survive by giving them complicated medical treatments... it's all great from a human point of view, but if you consider it from the evolutional side, we should actually refrain from this kind of help... But how could we? Dutch-flybaby is next on the list. 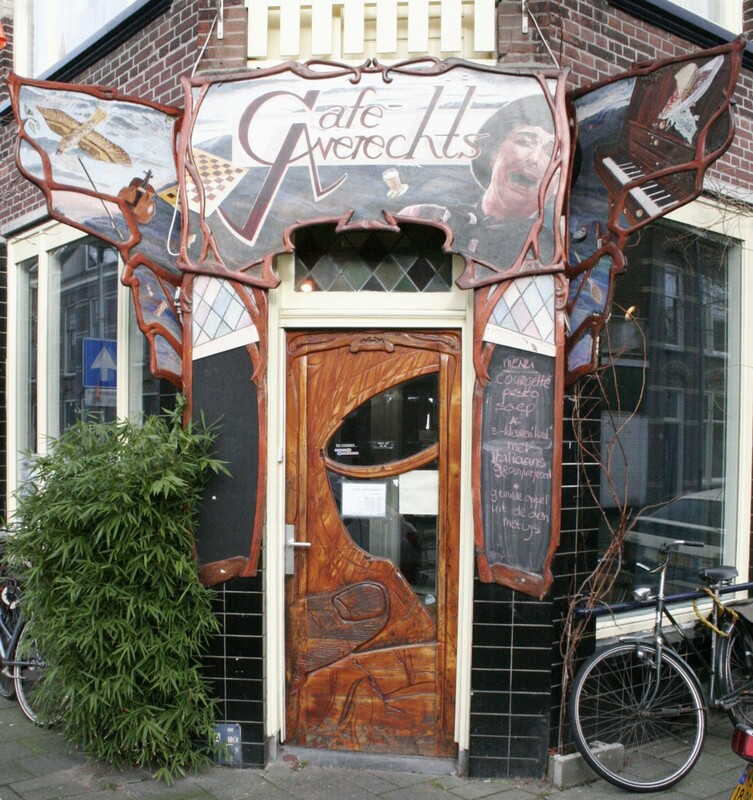 We will meet in Utrecht next week, so I'm not posting the book this time. Biba, thank you for sharing this book with us! I'm starting to read this book today. 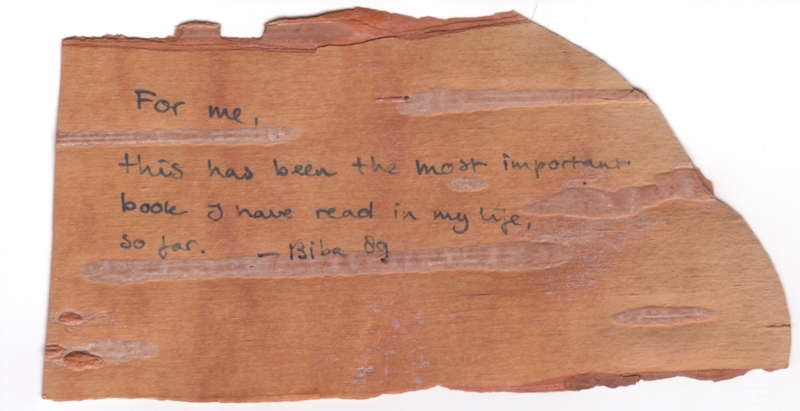 I'll add a scan of the note biba89 sent with the book. This book confirms a feeling I have had for the longest time: that the way we live is not 'the best way', because of the destruction we cause which will ultimately cause our demise. It has re-ignited my thinking about what I would do if I had cancer, why I feel my husband and I should not have children, vaccinations and many other things. I'm not religious at all and don't believe there are gods, but for myself I think of the leaver way as 'living in the hands of (the forces of) nature'. I'm a bit disappointed that Ishmael has not told us how to live as leavers which was to be expected, since he expects us to do our own thinking too. I think I will visit the website and see what's happening there. I want to read more Daniel Quinn books as well. Like biba I'm thinking about buying a case of books and giving them to several people I know because the more people are aware of these 'theories' and want to live this way, the sooner it will happen. Wouldn't it be nice if that would happen in my lifetime ?! I'm taking this book with me to the bookcrossingmeeting today and hope to find someone who will take it to maupi for me. If I can't find anyone I will mail this book to her within a week. 14.15 hrs: silvertje will take this book to maupi for me. Thanks Silvertje! Maupi gave it back to me, I believe she hasn't read it. I passed it on to Willemijn. When someone as interesting as biba gives me a book like this, a book that I would not give a moment of thought if I were on my one, I take it nevertheless. Who knows what it will do to me? Talking about serendipity. I was having a very interesting discussion with someone I met at the Earth Day lecture in Utrecht, during which I did recommend this book to him. Then along came Willemijn, who I was meeting for dinner after the lecture. She gave me back this book and I ran back in again to hand it over to a very baffled guy! Now I do hope he registers. And reads it. Since I started another ring with this copy, I will make sure that another copy finishes the ring.